Third house is the house for communication, messaging. It is also the house of short journeys. It is the house of courage, younger brother / sister, neighbors beside many other things. When Rahu is in the 3rd house, it gets strength because it is an “upachaya” bhava. “Upachaya” means growth, advancement, increment. Interestingly Good planets do not produce favorable results in the “Upachaya bhava”. It is not that good planets are bad, but they do not bring about favorable results as malefic planets. As Rahu is a materialistic planet, it brings materialistic gains and therefore it is considered favorable in the 3rd house. When Rahu is in the 3rd house, the native is courageous, bold, daring and can face any challenge in life. He can destroy his enemy easily and turns out to be victorious in the end. The native has a long life, is duty bound, respectful to all and does not discriminate amongst people. He is open-minded and balanced in his approach; he does not like to criticize others rather likes to devote his energy to help others. When Rahu is in the 3rd house especially in the sign of Mercury and Venus the native will have a very creative bent of mind. He will be a multi-talented person and excel in many fields. Rahu also does create challenges for the native when in the 3rd house. As the 3rd house is of efforts, he will never be reciprocated for his efforts in the same way. People will take the person for granted and his efforts will be wasted in pleasing others, he will only face disappointment in the end. As the 3rd house is of speech and communication, the native can say things which may be unpleasant, foul. He is likley to take wrong and hasty decsion. Rahu in the 3rd house can also make the person overconfident and arrogant. When Rahu is placed in the 3rd house it aspects the 7th house, the 9th house, and the 11th house. 7th house being of marriage, 9th house is the house of destiny and 11th house is of gains. Therefore during the mahadasha of Rahu the results of these houses will also be there. 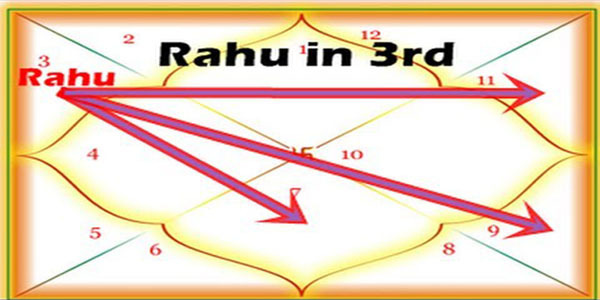 Some of the prominent personalities which have Rahu in the 3rd house in their lagna chart are Dirubhai Ambani, bollywood superstar Rajesh Khanna and former prime minister Shri Manmohan Singh. Of course, the heights these individuals achieved are not only because of Rahu placement in the 3rd house but also because of aspects and conjunction of other planets as well. Remedes for Rahu in the 3rd house. Given below are some of the remedies when Rahu is in the 3rd house in your lagna chart.